Who says opposites don’t attract? Sometimes the best compliment a person can have is someone who is everything they are not. Rory Macintosh is Pre-Med; super smart, quiet, shy, and doesn’t date (she’s a virgin). It’s not for lack of want to be with someone per-say but with her closed off persona and brutal honesty; people can’t really get close enough. To say this was good…understatement. Erin McCarthy did not disappoint in the least, I am completely smitten with Rory & Tyler…and Jessica, Nathan, Kylie, Jayden (U), Easton, and Riley. I was drawn in from the very beginning with expectations of how things would play out and was continuously surprised at the way the story evolved. I didn’t stop until the very last page and when I read the last sentence, I wanted to start from the beginning and read it all over again—seriously! This book had everything I look for to keep me engaged: back story with flawed but amazing characters (keeps it real), setting has to change (I like to travel all over the place—one of the minds greatest adventures). Dialog that has to be funny, witty and real, I need emotion conveyed through conversation and inner monologue; it needs to evoke some sort of reaction out of me. There has to be a storyline that keeps me guessing. And lastly, a love story (which really should’ve been first—great love, no matter the age is always something to look for and forward to, with or without an HEA). TRUE gave me everything; it was hard and soft, heavy and light, happy and sad, serious and funny. What’s not to love about a girl who falls for a guy and changes his life just by being in it? Rory learns about the true meaning of family and passion while Tyler learns that you don’t have to have much in order to be worthy of love. Gosh, I loved this book…If I could’ve given it more than 5 stars, I would have. 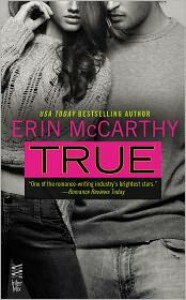 Brava Ms. McCarthy, my emotions are here on this page…and I am passionately in love with TRUE.